Do KDP Select Free Kindle Ebook Promotions Work? Do KDP Select free Kindle ebook promotions work? And create sales? 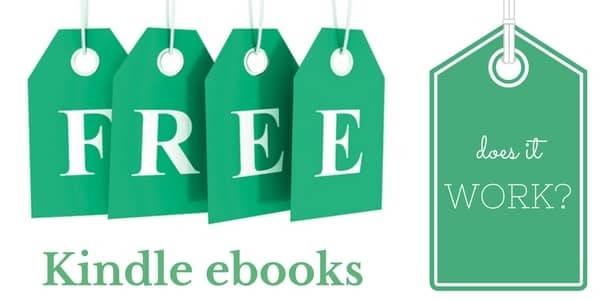 After a four-week blitz of free Kindle ebook promotions, I have to say that the defining answer as to whether free Kindle ebook promotions work, is well, yes, no and perhaps. There are so many factors at play when you use KDP Select’s free book promotion that in all honesty, it can become a bit confusing. Let me start at the beginning and the confusion might become clearer. My plan was to offer four books over four three-day weekends. To increase the exposure of each promotion I looked for ten sites that promote Free Kindle Ebooks but quickly discovered that most of them are very selective about what books they promote and there is no guarantee whatsoever that they will list your book. My feeling and I certainly can’t offer anything other than a feeling here, is that due to their selectivity, there is Amazon Associates affiliate marketing money at stake. While some ridiculously state that they only accept books with at least ten 5 star reviews, others offer the opportunity to pay exorbitant amounts of cash to list a free book. There are hundreds of Free Kindle promotion sites and I have to say that many aren’t worth the bother. However, out of the ten that I chose to list my promotion, one site did do exactly as promised. Free Ebooks Daily was the only one that delivered on everything as promised. So a big thanks to Sharrel at Free Ebooks Daily for all her help. Of the four books that I chose to promote, one did brilliantly; one did well and two were flops. Surprisingly for me, when I offered the first novel in a series it did very well. Two weeks later I offered the second in the series and it flopped. I suppose one conclusion could be that the first book was rubbish and no one wanted the second, but I’m not sure this was the problem. The first book managed to get listed by a few promo sites, but the second one didn’t and hence didn’t receive as much exposure. The surprise for me was a little romantic novella that I had as one of my four books. It went absolutely mad. No, ballistic in fact! It was downloaded so many times I was starting to think it was being downloaded on autopilot by a bot. It did provide me with some proof though that in this particular case, sales do follow a successful promotion and the book sold well for a few weeks. The other confusing factor is where your book ends up on Amazon’s bestseller lists. Some time ago, Amazon’s algorithms gave free downloads a chance to earn your book 15 minutes of fame. But Amazon now gives a lot less weight to free books, so you’re lucky if you get 90 seconds of fame. Unless your promotion results in immediate real sales, it will disappear extremely rapidly from view on the Kindle free bestseller list. I suppose the conclusion I have drawn is that the free book promotion option offered by KDP Select is a worthwhile marketing tool and a chance to get noticed and get your name out there as an author. Although it’s a bit pot luck, that’s still better than nothing. Trying to get a few good free book listing sites to add your book is certainly a way to help boost your exposure and is worthwhile as is a bit of good old-fashioned self-promotion on your social media networks. Secondly, gaining immediate sales from one book is unrealistic as it logically takes a reader a while to either read the book or more likely longer to get around to reading it. When they do, though, you need to have more books available. If you only have one book to offer, I think free book promotion is problematic unless it does so remarkably well that the book manages to keep a good bestseller ranking on Amazon for a week or more after the promotion. So was all the effort for a month worthwhile? I have to say yes. It helped sales, but only for a limited amount of time. So yes, overall free Kindle ebook promotion works. But no, it’s not going to succeed for every book. Just perhaps, though, there is a bit of luck involved too.